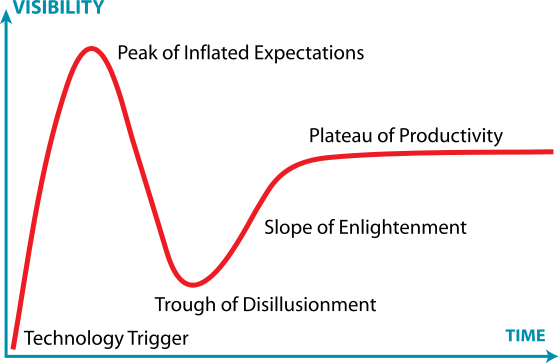 At the recent Games for Change Festival, Constance Steinkuehler displayed Gartner’s time-honored “hype cycle” and posited that learning games are somewhere on the Slope of Enlightenment (likely closer to the Trough than the Plateau). The Game Based Learning (GBL) space is idiosyncratic and will likely have a unique adoption curve (including multiple hype cycles), but the below diagram is still a useful tool for reflecting on the rise and (temporary) fall of our humble industry. The current GBL hype cycle wasn’t triggered by a particular game or product so much as Jim Gee’s seminal work, What Videogames Have to Teach Us About Learning and Literacy, released in 2003. In the ensuing decade, large amounts of soft capital from foundations and the federal government flowed into the space, research proliferated, and companies like Filament were born. Toward the peak of the curve, The New Media Consortium’s annual Horizon Report predicted that GBL would penetrate mainstream schools within 2 – 3 years, and did so from 2010 to 2012. The ensuing plummet to the Trough of Disillusionment was marked by the departure of several juggernaut foundations, the rise and fall of several hyper-funded GBL publishers, and the death throes of countless standalone supplemental offerings, lost in the byzantine maze of the institutional education market. Our fragile industry is battered and bruised, but I’m more excited about it now than ever. The fair weather fans have gone home and the noise-to-action ratio has improved dramatically. Climbing the Slope of Enlightenment will require hard (unglamorous) work, dedication, and patience, but the pot at the end of the rainbow is a sustainable market for high quality learning games. According to Amara’s Law, “we tend to overestimate the effect of a technology in the short run and underestimate the effect in the long run”. In the case of GBL, it’s really no surprise that “the long run” always feels tantalizingly out of reach. Compared to textbooks, worksheets and other traditional tools of the education trade, complex/immersive digital games are difficult to implement. They also don’t address burning day-to-day pain points. For instance, they don’t save time (in fact, they take more time), they don’t increase behavioral control (they decrease it), and they’re ill-suited for test preparation and rote memorization. Yes, they’re engaging, but No Child Left Behind doesn’t care about engagement, so why should schools? Ultimately, of course, schools should – and eventually will – care about games because they’re ideally suited to teach complex concepts and impart 21st century skills (AKA things that matter outside of school in the 21st century). Alas, the 21st century is still young. The short run – the era of hyperbole – is behind us. The long run – the era of mainstream acceptance wherein learning games are so commonplace as to not stand apart from the other tools in the proverbial teaching toolbox – is still a ways off…which means it’s time for the indefatigable among us to prepare for an extended siege; to expand the collective library of high quality learning game content, one title at a time, and to proselytize, educator by educator. Let the era of slow, incremental, hard-won, meaningful progress begin! Ooh, look! It’s VR for learning, chunk-chunk-chunking its way up to the Peak of Inflated Expectations like a roller coaster headed for an epic drop. BRB!